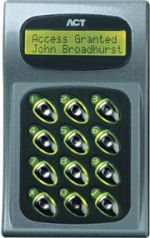 The ACT5 comes in a stylish polycarbonate housing with stainless steel keys. 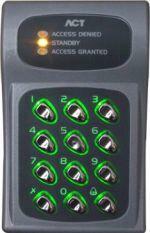 It may be surface or flush mounted on a standard gang electrical back box. 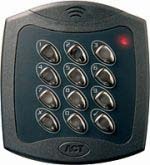 The ACT5prox Digital Keypad is a simple to use and easy to install standalone access control product. 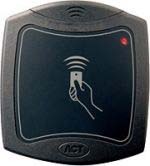 The ACT5prox may be surface or flush mounted onto a standard single gang electrical back box. The ACT10 comes in a stylish zinc diecast housing with stainless keys. It is surface mounted. The ACTpro-x 1030 Panel Mount proximity reader is used to read data stored on proximity cards or fobs. 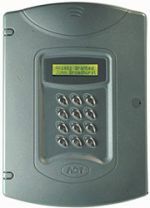 The data is passed onto the ACTpro 1000/2000/3000 controller, which decides to allow access or not. 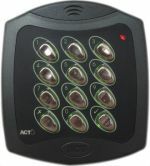 The ACTpro 1030 Panel Mount reader has a robust polycarbonate front plate and potted electronics with Clock & Data output.